At Christmas time we sing songs and hear stories of the Magi bringing gifts of frankincense, gold and myrrh to the baby Jesus. Back in ancient times, the resins of frankincense and myrrh were as highly prized as gold and often cost as much. Myrrh and frankincense have the same botanical genus Burseraceae and share many of the therapeutic properties. These two oils were mentioned throughout history in ancient papyri most notably for their cosmetic and medicinal uses. 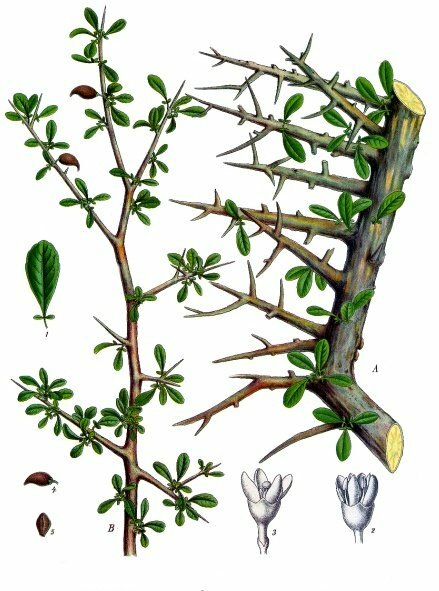 Steam distilled from the Commiphora myrrha, this shrub is found primarily through northeastern Africa, what was considered Southern Arabia in biblical times. It has been used in cosmetics, incenses, perfumes and in medicines for the last 3,000 years. 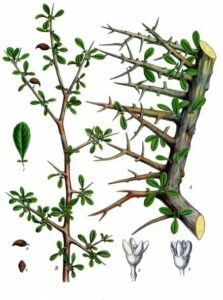 We currently use myrrh in skin care products, toothpastes, and perfumes and as an essential oil. Myrrh has stimulating and rejuvenating properties and is said to help in revitalizing aging wrinkled skin. Its fungicidal properties make it a useful aid in fighting athlete’s foot and other dermatitis concerns. Its anti-inflammatory, antiseptic abilities make it a wonderful salve to rub on wounds that are slow to heal or infected. Added to many toothpastes and mouthwashes, myrrh has antibacterial qualities that help fight bad breath and gum decay. Mouth/throat lozenges and gargles in the olden days were made from myrrh resins because of the efficacy in healing mouth ulcers, gingivitis and sore throats. Today we can use myrrh in steam inhalation to combat all throat complaints. As with frankincense, myrrh reduces catarrh, dries excess mucus, soothes sore throats, helps regain the voice after laryngitis or hoarseness, and fights chest infections. Stimulating the thyroid, myrrh helps regulate appetite (good for dieting) and encourages menstruation. Because it is an emmenagogue, inducing menstruation, it should not be used during pregnancy, but can be very useful with slow or prolonged labor and delivery. In a douche, myrrh can alleviate the pain and itching of yeast infections and vaginitis. Although not as widely used in rituals and ceremonies as frankincense, myrrh was considered a necessity in the embalming process and usually would fill the stomach cavity. Incense of myrrh balances the emotions and cools the atmosphere of tension, anxiety and high-strung emotions. Stimulating the 6th and 7th charkas, this resin resonates with the color blue/indigo, encouraging us to speak our truth from our higher selves. Although more yang in nature, myrrh also supports the feminine and can be used quite harmoniously in Goddess rites and rituals along with galbanum. After Christmas, when all the decorations are put away and we turn our thoughts to dieting and cleansing, myrrh is a great oil to include in your aroma lamp or massage oil. Especially with cold and flu season in full swing, what better combo than myrrh and its brother frankincense.